The use of social media – from blogging to online social networking to creation of all kinds of digital material – is central to many teenagers’ lives. Some 93% of teens use the internet, and more of them than ever are treating it as a venue for social interaction – a place where they can share creations, tell stories, and interact with others. The Pew Internet & American Life Project has found that 64% of online teens ages 12-17 have participated in one or more among a wide range of content-creating activities on the internet, up from 57% of online teens in a similar survey at the end of 2004. 39% of online teens share their own artistic creations online, such as artwork, photos, stories, or videos, up from 33% in 2004. 33% create or work on webpages or blogs for others, including those for groups they belong to, friends, or school assignments, basically unchanged from 2004 (32%). 28% have created their own online journal or blog, up from 19% in 2004. 27% maintain their own personal webpage, up from 22% in 2004. 26% remix content they find online into their own creations, up from 19% in 2004. The percentage of those ages 12-17 who said “yes” to at least one of those five content-creation activities is 64% of online teens, or 59% of all teens. In addition to those core elements of content creation, 55% of online teens ages 12-17 have created a profile on a social networking site such as Facebook or MySpace; 47% of online teens have uploaded photos where others can see them, though many restrict access to the photos in some way; and 14% of online teens have posted videos online. The current survey marks the first time questions about video posting and sharing were asked. Girls continue to lead the charge as the teen blogosphere grows; 28% of online teens have created a blog, up from 19% in 2004. The number of teen bloggers nearly doubled from 2004 to 2006. About 19% of online teens blogged at the end of 2004, and 28% of online teens were bloggers at the end of 2006. Overall, girls dominate the teen blogosphere; 35% of all online teen girls blog, compared with 20% of online teen boys. This gender gap for blogging has grown larger over time. Virtually all of the growth in teen blogging between 2004 and 2006 is due to the increased activity of girls. Older teen girls are still far more likely to blog when compared with older boys (38% vs. 18%), but younger girl bloggers have grown at such a fast clip that they are now outpacing even the older boys (32% of girls ages 12-14 blog vs. 18% of boys ages 15-17). The growth in blogs tracks with the growth in teens’ use of social networking sites, but they do not completely overlap. Some 55% of online teens have profiles on a social network site (SNS) such as Facebook or MySpace and those who have such profiles are much more likely to be bloggers than those who do not have social network profiles. Two in five (42%) teens who use social networking sites also say they blog. And, in keeping with the conversational nature of social media, social networking teens are also interacting with others’ blogs. Seven in ten (70%) social networking teens report reading the blogs of others, and three in four social networking teens (76%) have posted comments to a friend’s blog on a social networking site. Online boys are avid users of video-sharing websites such as YouTube, and boys are more likely than girls to upload. Fully 57% of online teens say that they watch videos on video sharing sites such as YouTube. Older online teens, especially older online boys (15-17), are more likely to report watching videos on video sharing sites when compared with younger teens. Online teen boys are also twice as likely as online teen girls to post video files (19% vs. 10%). Not even older girls – a highly-wired and active segment of the teen population – can compete with boys in this instance; 21% of older boys post videos, while just 10% of older girls do so. Digital images – stills and videos – have a big role in teen life. Posting them often starts a virtual conversation. Most teens receive some feedback on the content they post online. Once teens have posted photos or videos, conversation and feedback begin. Nearly nine in ten teens who post photos online (89%) say that people comment at least sometimes on the photos they post. Breaking it down, about half (52%) of teens who post photos online say that people comment or respond to their photos “sometimes.” Another third of those who post photos (37%) say that their audience comments on their posted photos “most of the time.” Only 10% of teens who post photos online say that people “never” comment on what they have posted. Teen video posters report a similar incidence of receiving comments when they post videos online; nearly three-quarters (72%) of video posters report that they get comments at least sometimes. A little under half (48%) of posters say that people “sometimes” comment on their video postings. Another quarter (24%) say that people comment on their online videos “most of the time.” A similar number (27%) say that they “never” get comments on posted videos. Comments and online conversation around content aren’t limited to images or videos posted online. As mentioned above, three-quarters (76%) of teens who use social networks say they comment on blog posts written by others. Most teens restrict access to their posted photos and videos – at least some of the time. Adults restrict access to the same content less often. Few teens who upload photos online consistently share them without any restrictions. While 39% say they restrict access to their photos “most of the time,” another 38% report restricting access “only sometimes.” Just 21% of teens who post photos say they “never” restrict access to the images they upload. Online adults are more lax in restricting access to their online photos; 34% restrict access most of the time, 24% some of the time, and 39% say they never restrict access to online photos. For the most part, teens who post video files want them to be seen. Just 19% of video posters say they restrict access to their videos “most of the time.” More than one-third of teens who post videos (35%) say they restrict access to their videos “only sometimes,” and 46% say they “never” limit who can watch their videos. Adult internet video posters have a similar profile of restrictiveness; 23% limit access to videos they post “most of the time,” 30% do so “some of the time,” and 42% never restrict who can watch videos they have posted. In the midst of the digital media mix, the landline is still a lifeline for teen social life. 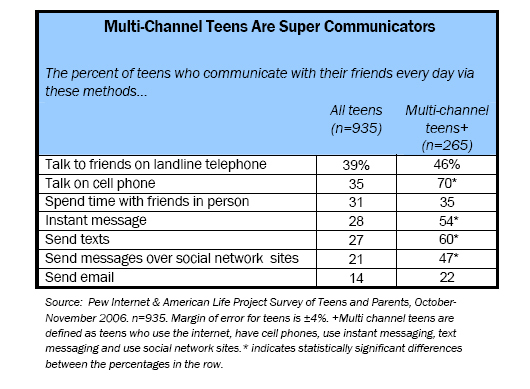 Multi-channel teens layer each new communications opportunity on top of pre-existing channels. Communications patterns among teens are shifting as their array of options grows. For the entire population of those ages 12-17, phone conversations and face-to-face meetings are the most frequently chosen ways to communicate with friends outside of school. But multi-channel teens – those teens who use the internet, instant messaging, text messaging a cell phone, and social networking sites – are more likely to turn to cell phones and digital media when communicating with friends. 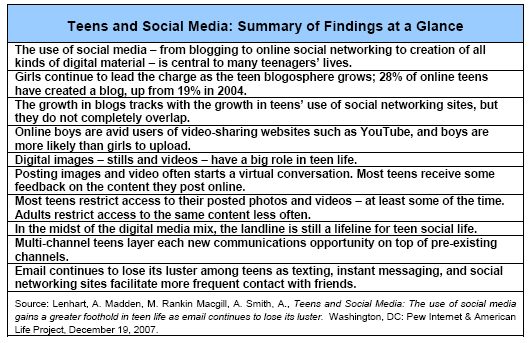 These multi-channel teens are super communicators who will use any tool at their disposal, but cell phones, instant messaging applications, and social networking channels rank higher in the panoply of their communications choices when compared with landline and face-to-face communication outside of school. Email continues to lose its luster among teens as texting, instant messaging, and social networking sites facilitate more frequent contact with friends. Despite the power that email holds among adults as a major mode of personal and professional communication, it is not a particularly important part of the communication arsenal of today’s teens. Only 14% of all teens report sending emails to their friends every day, making it the least popular form of daily social communication on the list we queried. Even among multi-channel teens, who are more likely to take advantage of any communication channel they have access to, just 22% say they send email to their friends daily.